Should Californians pay more for renewable electricity in hopes that the state will gradually move away from relying on fossil fuel-based power plants? If so, how much more? That’s a tough issue to consider, and it formed the basis of a decision by the state regulators on Thursday to approve two contracts for solar farms that they say should help reduce the costs of producing solar energy in the future. The California Public Utilities Commission voted 5-0 to approve two power purchase agreements between developer BrightSource Energy and Southern California Edison. The contracts will see power flowing from the yet-to-be-built Rio Mesa 2 and Sonoran West. At the same time, the commission rejected Edison’s request to approve three other contracts with BrightSource. Edison actually sought approval for all five contracts, totaling 1,000 MW, back in 2009, when energy storage played no part. Then it re-negotiated the contracts with BrightSource in 2011 after BrightSource had modified those power plant proposals to reduce their environmental impact. This time around, energy storage made its way into three of the contracts. The decision was a compromise. The commissioners were set to vote on the five contracts back in August, but postponed it because they were wrestling with which of the five they should approve. The commission’s own staff recommended approving contracts for three projects that would include storage and denying two projects that wouldn’t have storage. With energy storage, a utility could bank electricity when demand is low and release the power when demand is high. It makes a solar power plant act more like a conventional fossil fuel power plant, which can produce power any time of the day. So while using storage will add cost and increase the price of a contract, its benefits outweigh the expenses, the commissioners said, particularly since California requires its utilities to increase the amount of renewable electricity in their supplies until it reaches 33 percent by 2020. Under law, utilities need to provide power reliably to their customers regardless of the sources of their electricity. But commissioners didn’t see their vote for the five contracts as quite so black and white. One issue was the contract pricing and the other one was a more philosophical deliberation about how to chart a path to cleaner and more affordable energy by 2020. Commission President Michael Peevey came up with a compromise plan and won the support of the four other commissioners. 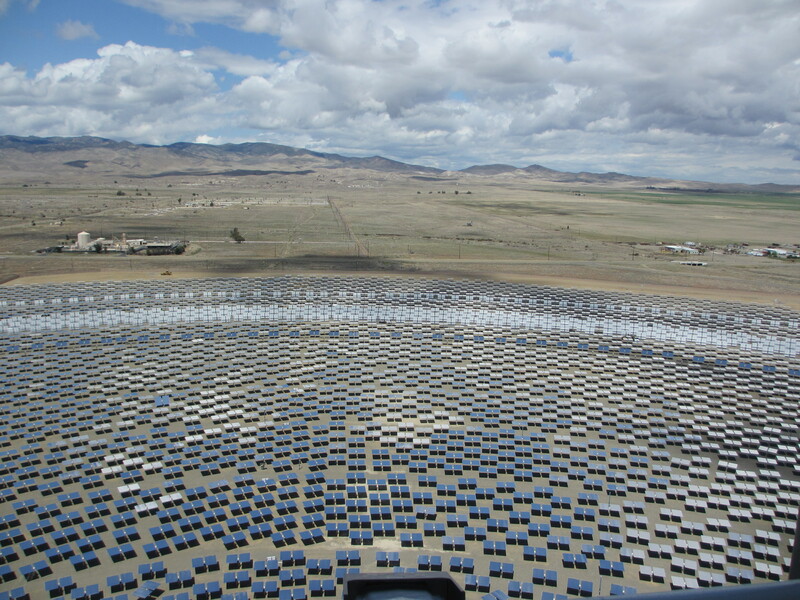 The contracts for Rio Mesa 1 and Rio Mesa 2, totaling 400 MW, are way pricier than bids submitted to Edison while it was renegotiating with BrightSource, the commission noted in its proposed decision. But the commissioners didn’t want to say no to both contracts because BrightSource plans to use newer technology that it says will use land more efficiently and therefore reduce its projects’ environmental impact. The commissioners wanted to give BrightSource a chance to use the new technology, so during its Thursday vote, it approved the contract for Rio Mesa 2 but said no to Rio Mesa 1. The commissioners also said no to two of the three projects, Siberia 1 and Siberia 2, that contain energy storage because those two are proposed for a location that would likely require an upgrade of the transmission lines there in order to deliver power from the two solar farms. That upgrade would be so expensive as to “render the projects infeasible,” the commission said. The remaining project with storage, Sonoran West, is priced competitively against competing bids, so the commission voted for it. Allowing BrightSource to use the new technology and storage is important for the state to get cleaner and cheaper power in the future, the commissioners said. Commissioner Mike Florio, who usually cites high prices as the chief reason for voting against certain contracts – he cast the lone “no” vote for the solar power contract between Abengoa and Pacific Gas & Electric last year – said he supported Peevey’s compromise because it promises a clear progression toward lower-cost solar power. Winning those contracts is crucial for BrightSource to raise money for building those plants. Investors will more likely put up money if they know BrightSource already has found buyers for its projects. Incidentally, the company announced yesterday that it had raised an equity round of $80 million. 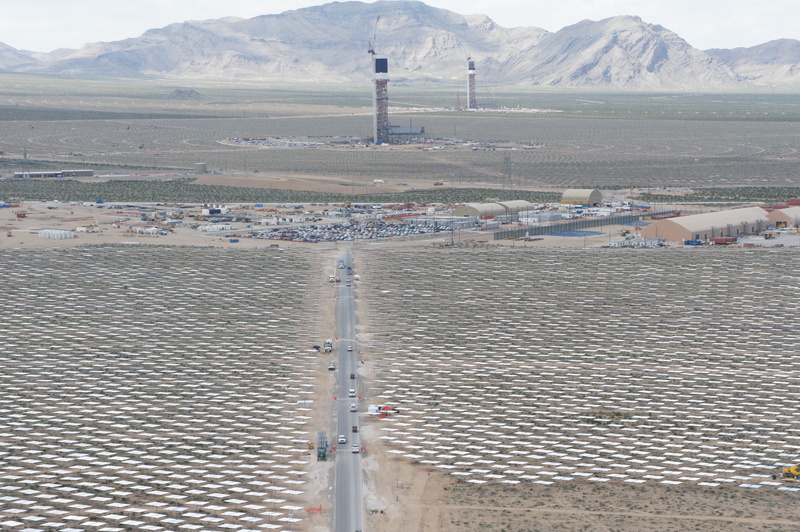 The company is building its first solar power plant called Ivanpah, in California.